Harold Pinter’s 1965 play, The Homecoming, is a masterpiece of modern drama every bit as pregnant with meaning as any of the classics. Jamie Lloyd’s 50th anniversary revival at Trafalgar Studios does justice to the work, making it accessible to a new generation by adopting some of the stylistic conventions and effects taken for granted in twenty-first century film. This production also brings out the dark comedy from what was always a wickedly funny text. 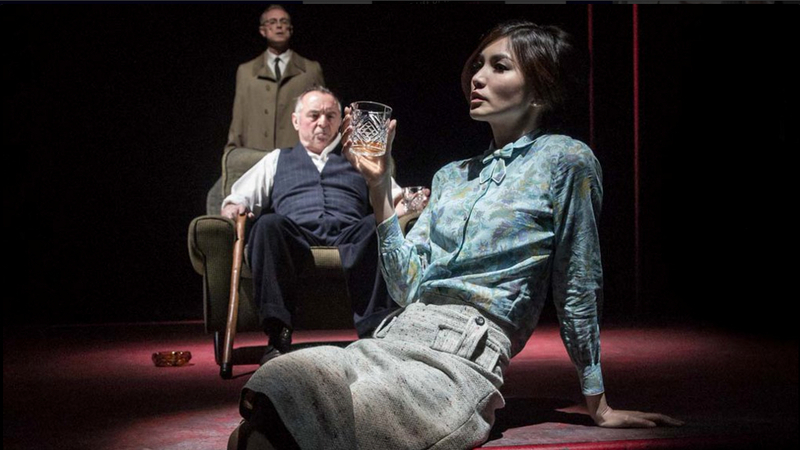 The Homecoming, written by Harold Pinter, directed by Jamie Lloyd. Starring Keith Allen (Sam), Gemma Chan (Ruth), Ron Cook (Max), Gary Kemp (Teddy), John Macmillan (Joey) and John Simm (Lenny). The acting is impeccable and Soutra Gilmour’s stage set minimalist, yet inspired. The large room in which most of the action takes place is shown with red “perspective” lines running along the corners and sharply away to the back of the stage and the entrance door to the house, which both gives an impression of great size and yet some claustrophobia in this space. The direction is pacey, again possibly with an eye on appealing to an online generation with shorter attention spans, to the extent that in the opening dialogue, Max’s lines even sound surprisingly rushed. Later, though, Ron Cook unfolds the full complexity of Max’s tormented and vicious soul. Gary Kemp’s Ted is rather more donnish than previous interpretations and yet contains flashes of a harder interior and hints of occasional bullying menace more characteristic of his father. Earlier productions made the homecoming academic more of an outsider to the family dynamic, whereas this Ted more convincingly showed his provenance. His chilling resignation to his own repression is a tragic journey, which is caught perfectly by Kemp. Somehow his teacherly demeanour lends greater credibility to the unravelling of his relationship with his wife. Keith Allen plays put-upon uncle Sam, the chauffeur, with a camp flourish, and yet brings a self-possessed confidence to the character, giving Max more of a run for his money than in earlier productions, especially since Ron Cook’s Max is more prone to show weakness than is superficially apparent in the script. There are hints in the quips of his brother that Sam is gay, but this is the first production I have seen in which his portrayal gives this dimension full rein. His lack of conventional masculinity is his escape valve from the otherwise suffocating male insecurity and misogyny which run rife in this family, and are so well portrayed by John Simm’s Lenny, a real tour de force of urbane, sneering menace. Gemma Chan, as Ruth, succeeds in capturing a woman haunted by her past, lost, alienated and looking for a role and a home she can inhabit. John Macmillan shows a powerful frustration as boxer Joey, lacking the words to voice his hard experience within this dysfunctional family. The special lighting and sound effects by Richard Howell and George Dennis respectively are the seventh character. The leads are periodically caught in their own world of torment as sounds and flashing lights accentuate their paroxysms of pain. For an earlier generation, Pinter’s intense script sufficed to convey this. It is debatable whether this new underlining technique is necessary, but it is brilliantly executed and acted. Once again, the production’s modernity involves painting the canvas heavily so that, for example, the script’s hints of child abuse in the family are given as much clear expression as possible in the phrasing and direction here. I was fortunate to have the chance to meet Pinter in person not long before his death. It was at the 2007 premier for the film remake of “Sleuth”, starring Michael Caine and Jude Law, for which Pinter had written the screenplay (he also had a brief cameo on a television screen within the film). In the original 1972 film Caine had played the younger man to Laurence Olivier’s older man so it was a nice twist that in the remake, Caine reappeared, but this time as the older man. Pinter was already quite frail then and in a bizarre way, worthy of one of his plays, he was sat alone in a corner at the party afterwards, a lone unsung hero of the night. Yet when I approached him he was very happy to chat. His psychological insight and mordant wit shines on in this admirable and welcome revival. The Homecoming was at the Trafalgar Studios from 15 November 2015 to 13 February 2016.